Figure 1 of Kojima, Mol Vis 2010; 16:2457-2464. Figure 1. 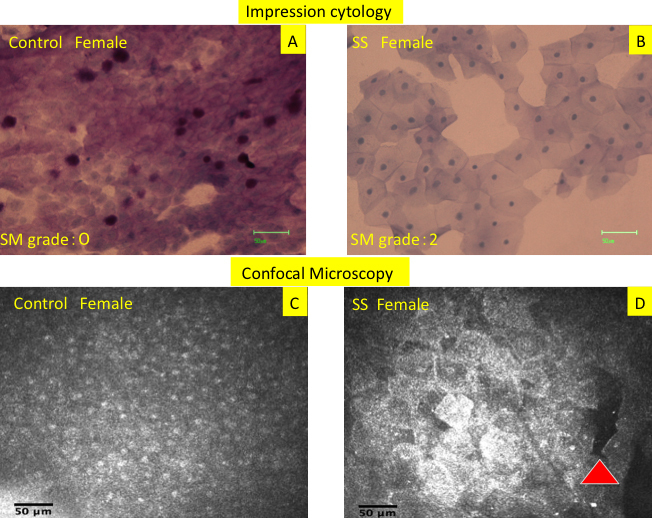 Impression cytology imprints and in vivo confocal microscopy scans from representative Sjogren syndrome patients and control subjects. A: Conjunctival impression cytology imprint showing sheets of epithelial cells with scanty cytoplasm and large nuclei in a 42 year old female control subject. Nelson’s squamous metaplasia grade: 0 Mean MIECA: 308 μm2 Mean N/C: 0.52. B: Imprint from a 38 year old female SS patient shows consistently large epithelial cells with abundant cytoplasm and pyknotic nuclei. Nelson’s squamous metaplasia grade: 2. Mean MIECA: 1799 μm2 Mean N/C: 0.18. C: Confocal microscopy scan showing sheets of densely packed small epithelial cells with large nuclei and scanty cytoplasm in the same control subject. Mean MIECA: 266 μm2 Mean N/C: 0.55. D: Confocal microscopy scan showing enlargement of individual superficial epithelial cells with pyknotic nuclei. Red arrow shows an area of cellular drop out. Mean MIECA: 1490 μm2 Mean N/C: 0.22.